Stomp boxes, also known as guitar effect pedals, are, as the name suggests, foot-operated equipment used by electric guitarists to produce preset effects such as distortion, wah-wah, delay, chorus and phaser. Many players will have a bank of up to 20 stomp boxes, each providing a different effect. 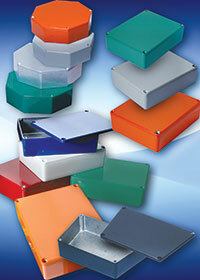 The 1590 STOMP boxes are available in rectangular, trapezoidal and octagonal designs. All are rugged, easy to machine enclosures, well able to cope with the demanding on-stage environment in which they will be used. The ­latest addition to the family is a 119 x 94 x 42 mm rectangular unit, the same as the most popular plan size but 8 mm deeper, designed to accept deeper break-before-make switches that stop conducted interference when operated. All types are finished in a smooth gloss polyester powder paint, which does not chip after machining and provides a good surface for labels and silk screening. In order to help the musician quickly identify individual pedals when on stage, the units are available in seven strong and vibrant colours: cobalt blue, RAL 5013; green, RAL 6024; light grey, RAL 7035; orange, RAL 2009; purple, RAL 4008; red, RAL 3011 and yellow, RAL 1021, all available ex-stock; the units can be supplied in other colours to order to match corporate styles. A lap joint seals the units to IP54, protecting against the ingress of dust and water, and the painted finish is only applied to the external surfaces, maintaining RFI integrity. If required, the rectangular versions can have enhanced IP65 protection through the addition of an optional sealing gasket kit. To reduce time to market and modification costs, all 1590 STOMP enclosures are available factory modified with machining and silk screening to the user’s specification. To help with the design process, AutoCAD and PDF dimensioned drawings can be downloaded.